Economy Custom Travel Dental Kits, Personalized in Bulk. Promotional Dentist Gift. Budget Prices in USA and Canada. Clear, Translucent Blue, Red or Green. Wholesale personalized travel dental kits, custom imprinted with your logo or message. 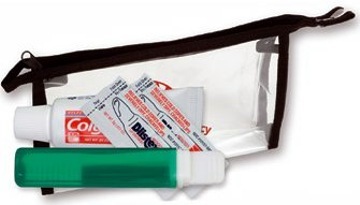 We also supply blank (not imprinted) wholesale travel dental kits. Lowest prices in the USA and Canada for wholesale travel dental kits . Free artwork design. US clients pay no taxes. We will send you a proof for your approval before production. Set-up Charge: $45.00 per color/position, copy or logo. $22.50 on exact repeat orders (logo included). Additional Colors/Positions: Add $0.25 per dental kit. Set-up Charge: $45.00 per color/position. Additional imprint color or position: add$0.25 per dental kit. The Travel Dental Kit Includes a travel toothbrush in assorted colors (toothbrush color will vary from kit to kit), a tube of Colgate toothpaste and 2 Blistex packets.